Gee whiz, that was fun! On Monday, I had the distinct pleasure of chatting with Pat Sloan on her quilting podcast, American Patchwork & Quilting Talk Show. When Pat first invited me on the show, there was no doubt I'd say YES, but I'll admit I was quite nervous! But when it came right down to it, I totally enjoyed it, and, of course, Pat was very easy to talk to. In fact, now in the afterglow, I'm wishing we could really sit down and chat in person.... maybe some day. 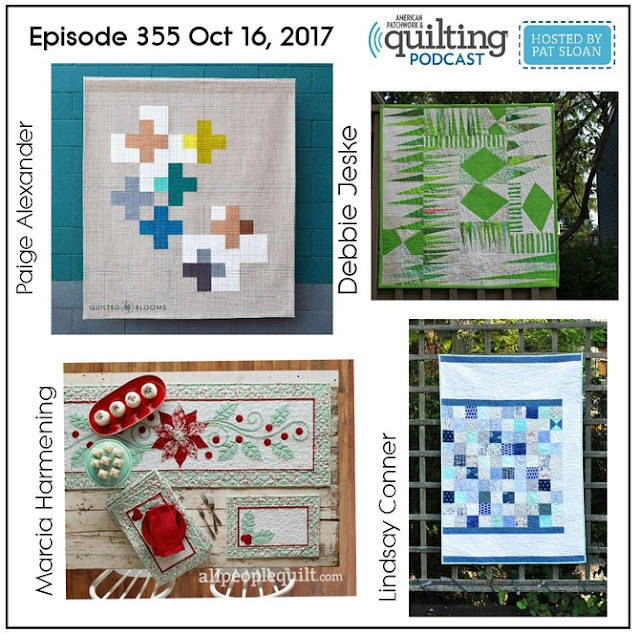 The other guests on the show were Marcia/happystash quilts, Paige/QuiltedBlooms, and Lindsay/Lindsay Sews. Pat's concept of hearing from several members of the online community each week makes for a quick-paced and engaging show. And that's a good thing! If you missed it, you can listen in here. We talked about how I transitioned from being a traditional quilter to more modern, some of my process - which is very hard to describe when most of what you do is improvisational, Instagram sewalongs, and more. Crazy how much you can fit into 12 minutes! Excellent podcast! I enjoyed hearing about your journey. Pat saved the best for last! It was nice to sit back, relax and enjoy the rest of the show! I loved hearing about you just cutting into fabric to see where it takes you...I don't think I'll ever get to that point! I had a chance to listen to the show yesterday and I thought you did a marvellous job. You sounded really confident and you spoke really well about getting started into modern improv quilting. I have taken some mental notes and am mulling over how I can step away from my nervousness about improv and take a small step into experimentation. Well, I guess I have to listen to my first quilting podcast! How awesome! You were great! It really sounded like a fun conversation between friends! I really enjoyed it! I finally had a chance to listen to the podcast this morning. I really enjoyed hearing more of your story. I must say I am in awe of the notion of just starting in without a sketch or anything. As you know, I plan. True improv is not my thing so I truly admire people like you who do it so very well. On a side note I'm thinking about doing the cross cut at my guild retreat coming up next month. Such a wonderful concept. We'll see. I have way too many plans for such a short amount of sewing time. I completely agree with Pat's plug for your blog. "I love the writing, sharing and inspiration at Debbie Jeske’s site A Quilter’s Table. She is a long time quilter, and now works in a improvisational manner. She hosts lots of sew alongs, shares her work as she goes and I love her thoughts on how we feel about our work. She keeps it real and you’ll want to start following her!" Now I'm going to listen while I sew!